This month at the Trust Review we’re going to intersperse the more recent articles and posts with some goodies, but oldies, including one article from the 90s because, really, trust, trust never changes. Yves Smith tries to answer the question, how long can trust created by public institutions last? Well, here’s a hint, you can tell where the Hapsburg Empire once ruled by levels of trust in public institutions? Whoa. Doug Bartholomew of Industry Week discusses the issue of trust between manufacturing suppliers and their customers, including hard data from 90s on how top suppliers operate. I wonder if it’s still true that trust pays for suppliers. The Trust Diva blog wonders if a contract can actually save you from the bad intentions of someone you’re doing business with. Or, to put it another way, should you do business with someone you don’t trust, trusting the contract to keep them on the straight and narrow? Daniel H. Pink writes about a Columbian bank’s efforts to use incentives to convince its loan officers to not leave their work till the end of the month. Did it work? And more broadly, do incentives work? Brad VanAuken makes a point about brands, a brand is nothing without trust. Or, to put it another way, like McDonalds food, or hate it, you know what you’re getting when you order a Big Mac. A brand is a promise. At the same blog, Mark Ritson meditates on Sri Lankan beer and trust. 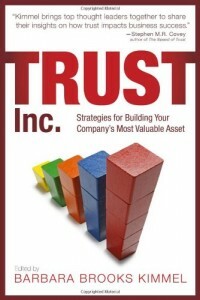 The McLaren blog has a 12 part series on trust building behavior, and they’re up to number 11. A good reminder of the basic points. Start with number 1 – straight talking. Anthony Iannarino writes about delegation—the art of giving tasks to their rightful owners, which means trusting them. Dave Brock writes about the commoditization of referrals, the invitations to join “referral networks” with people you don’t even know and receive prizes in exchange for referrals. Discover magazine on how the perception of choice makes us lose our compassion for people. Even if those people were completely the victim of circumstances. Denny Coates: trust and they will trust back, give and they will give back. Do you believe this is true? If you’d like to share a great article about trust, let us know, in the comments here.